We are currently in the middle of a glacial period (although it’s less intense now than it was 20,000 years ago) but this is not the only period of glaciation in Earth’s history; there have been many in the distant past, as illustrated in Figure 16.2. In general, however, Earth has been warm enough to be ice-free for much more of the time than it has been cold enough to be glaciated. The oldest known glacial period is the Huronian. Based on evidence of glacial deposits from the area around Lake Huron in Ontario and elsewhere, it is evident that the Huronian Glaciation lasted from approximately 2,400 to 2,100 Ma. Because rocks of that age are rare, we don’t know much about the intensity or global extent of this glaciation. Late in the Proterozoic, for reasons that are not fully understood, the climate cooled dramatically and Earth was seized by what appears to be its most intense glaciation. The glaciations of the Cryogenian Period (cryo is Latin for icy cold) are also known as the “Snowball Earth” glaciations, because it is hypothesized that the entire planet was frozen — even in equatorial regions — with ice on the oceans up to 1 km thick. A visitor to our planet at that time might not have held out much hope for its inhabitability, although life still survived in the oceans. There were two main glacial periods within the Cryogenian, each lasting for about 20 million years: the Sturtian at around 700 Ma and the Marinoan at 650 Ma. There is also evidence of some shorter glaciations both before and after these. The end of the Cryogenian glaciations coincides with the evolution of relatively large and complex life forms on Earth. This started during the Ediacaran Period, and then continued with the so-called explosion of life forms in the Cambrian. Some geologists think that the changing environmental conditions of the Cryogenian are what actually triggered the evolution of large and complex life. There have been three major glaciations during the Phanerozoic (the past 540 million years), including the Andean/Saharan (recorded in rocks of South America and Africa), the Karoo (named for rocks in southern Africa), and the Cenozoic glaciations. The Karoo was the longest of the Phanerozoic glaciations, persisting for much of the time that the supercontinent Gondwana was situated over the South Pole (~360 to 260 Ma). It covered large parts of Africa, South America, Australia, and Antarctica (see Figure 10.4). As you might recall from Chapter 10, this widespread glaciation, across continents that are now far apart, was an important component of Alfred Wegener’s evidence for continental drift. Unlike the Cryogenian glaciations, the Andean/Saharan, Karoo, and Cenozoic glaciations only affected parts of Earth. During Karoo times, for example, what is now North America was near the equator and remained unglaciated. Earth was warm and essentially unglaciated throughout the Mesozoic. Although there may have been some alpine glaciation at this time, there is no longer any record of it. The dinosaurs, which dominated terrestrial habitats during the Mesozoic, did not have to endure icy conditions. A warm climate persisted into the Cenozoic; in fact there is evidence that the Paleocene (~50 to 60 Ma) was the warmest part of the Phanerozoic since the Cambrian (Figure 16.3). A number of tectonic events during the Cenozoic contributed to persistent and significant planetary cooling since 50 Ma. For example, the collision of India with Asia and the formation of the Himalayan range and the Tibetan Plateau resulted in a dramatic increase in the rate of weathering and erosion. Higher than normal rates of weathering of rocks with silicate minerals, especially feldspar, consumes carbon dioxide from the atmosphere and therefore reduces the greenhouse effect, resulting in long-term cooling. 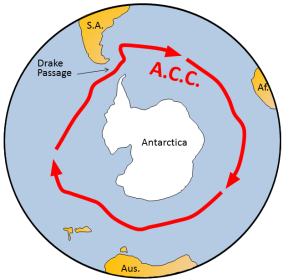 At 40 Ma, ongoing plate motion widened the narrow gap between South America and Antarctica, resulting in the opening of the Drake Passage. This allowed for the unrestricted west-to-east flow of water around Antarctica, the Antarctic Circumpolar Current (Figure 16.4), which effectively isolated the southern ocean from the warmer waters of the Pacific, Atlantic, and Indian Oceans. The region cooled significantly, and by 35 Ma (Oligocene) glaciers had started to form on Antarctica. Global temperatures remained relatively steady during the Oligocene and early Miocene, and the Antarctic glaciation waned during that time. At around 15 Ma, subduction-related volcanism between central and South America created the connection between North and South America, preventing water from flowing between the Pacific and Atlantic Oceans. This further restricted the transfer of heat from the tropics to the poles, leading to a rejuvenation of the Antarctic glaciation. The expansion of that ice sheet increased Earth’s reflectivity enough to promote a positive feedback loop of further cooling: more reflective glacial ice, more cooling, more ice, etc. By the Pliocene (~5 Ma) ice sheets had started to grow in North America and northern Europe (Figure 16.5). The most intense part of the current glaciation — and the coldest climate — has been during the past million years (the last one-third of the Pleistocene), but if we count Antarctic glaciation, it really extends from the Oligocene to the Holocene, and will likely continue into the future. The Pleistocene has been characterized by significant temperature variations (through a range of almost 10°C) on time scales of 40,000 to 100,000 years, and corresponding expansion and contraction of ice sheets. These variations are attributed to subtle changes in Earth’s orbital parameters (Milankovitch cycles), which are explained in more detail in Chapter 21. Over the past million years, the glaciation cycles have been approximately 100,000 years; this variability is visible in Figure 16.5. This diagram shows the past 500,000 years of the same data set as that shown in Figure 16.5. 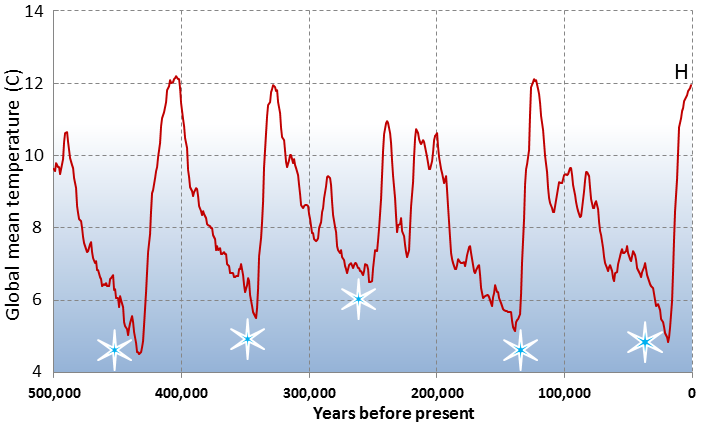 The last five glacial periods are marked with snowflakes. The most recent one, which peaked at around 20 ka, is known as the Wisconsin Glaciation. Describe the nature of temperature change that followed each of these glacial periods. At the height of the last glaciation (Wisconsin Glaciation), massive ice sheets covered almost all of Canada and much of the northern United States (Figure 16.6). 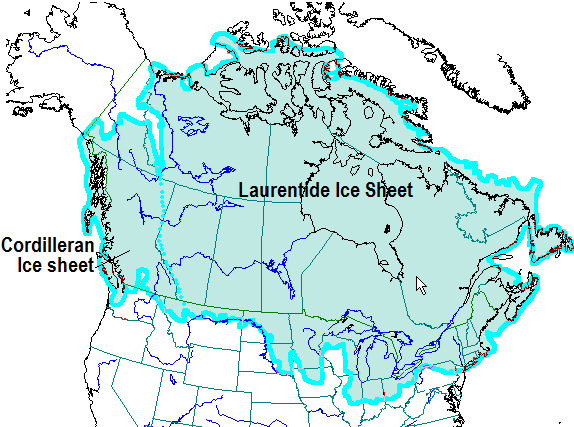 The massive Laurentide Ice Sheet covered most of eastern Canada, as far west as the Rockies, and the smaller Cordilleran Ice Sheet covered most of the western region. At various other glacial peaks during the Pleistocene and Pliocene, the ice extent was similar to this, and in some cases, even more extensive. The combined Laurentide and Cordilleran Ice Sheets were comparable in volume to the current Antarctic Ice Sheet. 16.1 Glacial Periods in Earth’s History by Steven Earle is licensed under a Creative Commons Attribution 4.0 International License, except where otherwise noted.